When the closing credits of Survival rolled in 1989, no one watching knew that Doctor Who would not return for a good long while. Production on what would have been season 27 had been suspended leaving potential future storylines for the Seventh Doctor and Ace in limbo. After the very successful first Lost Stories season featuring the Sixth Doctor, Big Finish have brought to life the missing Season 27, giving us an incredibly fascinating insight into where the show would have gone if it had not been taken off the air. The first of these stories is Thin Ice, known popularly as Ice Time in fan lore. It is Russia in 1967. The Cold War is raging and the Russians are hoping to gain an advantage with the retro engineering of captured Alien Technology but not just any alien tech. This is the ancient horde of a Martian war lord and his devoted followers want it back. Meanwhile the Doctor and Ace arrive and in the midst of getting entangled in the various powers wanting this technological prize, Ace begins to suspect that the Doctor once again knows more than he is letting on. It is no secret that the returning monsters in this story are the Ice Warriors, who have become something of a favourite recurring foe in the recent audios. But that isn’t a bad thing, due to the vocal mastery of Nicholas Briggs who brings real, dare I say it, humanity to the reptilian warriors. The appropriately named Hhessh is a fantastic character, speaking one line in particular that had this reviewer stifling laughter on public transport. Various supporting Ice Warriors as well as a number of key supporting parts are played very well by veteran Nigel Lambert. Sylvester McCoy is in fine form, accurately recreating the rather secretive seventh Doctor from his time on the show and Sophie Aldred slips back into a younger Ace with such ease that is completely believable. The supporting characters are equally well drawn with special mention going to Ricky Groves who makes a convincing Harry Palmer/James Bond turn as Markus Creevy. Beth Chalmers, who will have a greater part to play in the upcoming season, is brilliant in a play in which everyone has a moment to shine. Writer Marc Platt has done something quite remarkable with Thin Ice, in that he creates the feel of a McCoy era television story on audio so convincingly you can see it in your head... most of the time. However little touches such as the biker gang with Ice Warrior helmets recall the Cyber Henchmen from Silver Nemesis; visual ideas so baffling they could only work on television, which is one of the weaker points of the audio in that a lot of visual ideas fall a bit flat in the audio medium. 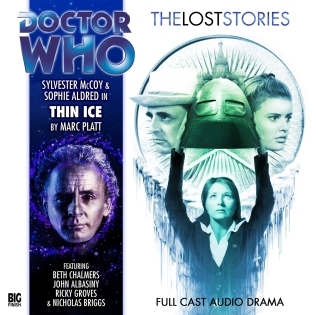 All in all, Thin Ice is a rather fun and exciting way to kick off this season of Lost Stories, with some rather unexpectedly dark moments and little hints of the stories to come. If Season 27 had seen the light of day on television, this story would’ve given Doctor Who a strong direction in the nineties. Review: The Lost Stories - [3.03] The Children Of Seth - CDDoctor Who The Lost Stories: The Children Of Seth, Big Finish Audio CD Review for Doctor Who Online.Review: The Lost Stories - The Fourth Doctor Box-set - CDDoctor Who: The Lost Stories - The Fourth Doctor Box-Set, Big Finish Audio CD Review for Doctor Who ...Review: The Lost Stories - [2.04] Crime Of The Century - CDDoctor Who The Lost Stories: Crime of the Century, Big Finish Audio CD Review for Doctor Who Online.